Martin K. Lewis (left) is Bill and Sydney Cole Alexander is Eleanor in Ray Yamanouchi’s The American Tradition. Top: Lewis (rear) with Alex Herrald (left) as the slave owner Walsh, and Hunter Canning as the abolitionist Buckley. The American Tradition is broadly about racism; it’s a combination burlesque and thriller about a black slave couple fleeing the antebellum South to find freedom in the North. The marrieds are an unusual pair, however: the wife, Eleanor (Sydney Cole Alexander), can pass for white, while her husband, Bill (Martin K. Lewis), has no such ability. To reach safety, Eleanor dresses as a man, Evander, and Bill poses as her slave for a train trip north; they become involved with a nutsy little slave owner named Walsh (Alex Herrald) who drinks heavily and is en route to meet a bigwig in the Ku Klux Klan to secure an admissions interview. He accepts that Eleanor is a white man and a fellow racist, and attaches himself to “him” like a barnacle. To change the mind of an entire nation, one must also expose the other as the enemy and that is the true motive of the movement. It is not about legitimizing the self but delegitimizing the other. Eleanor and Bill become separated and have adventures. Bill rescues a female slave named Rose who has been badly mistreated by Walsh. Eleanor, meanwhile, is searching desperately for Bill while discouraging googly-eyed romantic hints from Buckley. Herrald as Walsh (left) is taken in by the disguise of runaway slave Eleanor (Alexander). Photographs by Jody Christopherson. In revisiting the horrors of slavery, Yamanouchi doesn’t come up with much that’s fresh beyond his approach: Eleanor’s disguise as a man is as old as Twelfth Night; the involuntary Nazi-style salute from Buckley is a steal from Dr. Strangelove; and Rose’s descriptions of Walsh’s beatings call to mind 12 Years a Slave. What does it all mean if we die here? You never trusted me, Bill. Why? What am I to you? Some accessory? Don’t “save” me if you don’t actually care about me, about us. You men... You men fight against the white master while stepping on the backs of black women. Avin’s actors handle the mash-up of periods with aplomb. 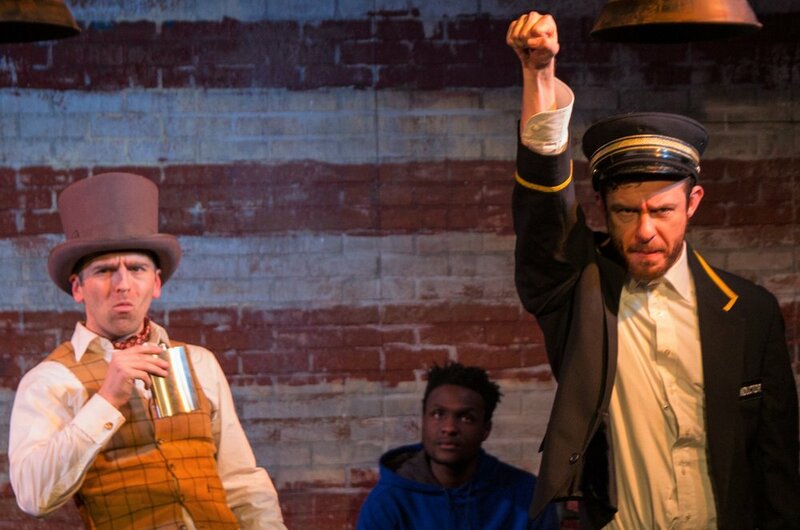 The quick-speaking, ever-clear Herrald is terrific as Walsh, a pinched little villain, and Canning boomerangs between passionate abolitionist and moony suitor with ease. Danie Steel is a powerful Rose, and Lewis holds up his end with the more stolid Bill. Yamanouchi’s message, whether about racism or slavery or feminism, may be familiar, but the packaging and performances are just lively enough to put it over. New Light Theater Project’s production of The American Tradition runs through Feb. 16 at the 13th Street Theater (50 W. 13th St., Manhattan). Evening performances are at 7:30 p.m. Wednesday through Saturday; matinees are at 3 p.m. Saturday and Sunday; there is no matinee on Feb. 16, but an added performance at 7:30 p.m. on Monday, Feb. 11. For tickets and information, visit newlighttheaterproject.com.